Comic-Con, what can I say, its an experience. Upon arrival we realized something was different about this place as we pulled up behind a pedi-cab and Mr. Mayhem says “hey, that looks like the chair from Game of Thrones!” Having not seen the show, I said no, I think it looks like a Thanksgiving turkey, why someone would be driving a Thanksgiving pedi-cab in downtown San Diego in July I could not surmise. 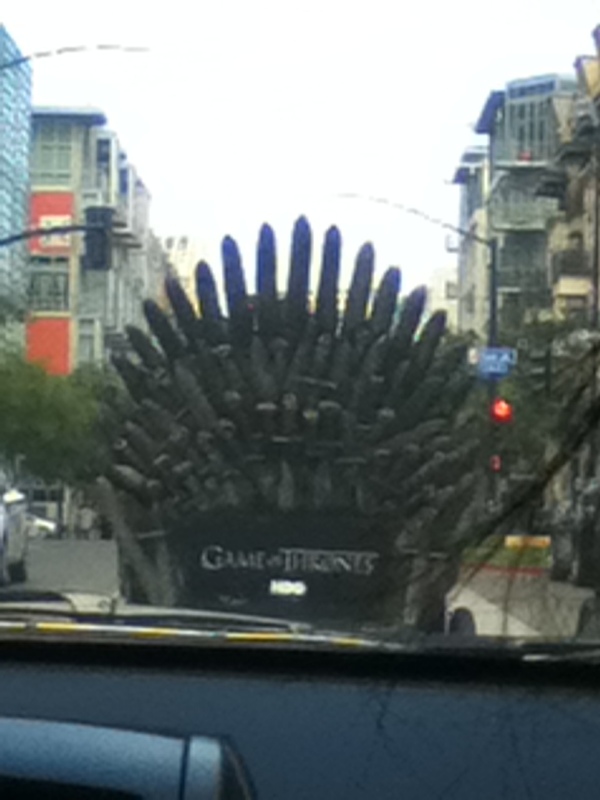 But, as we got closer I had to concede, it was in fact a Game of Thrones pedi-cab. Only at Comic-con. We parked the car and paid a very reasonable $50 for the priviledge, why not, and waded into the madness. Everywhere you looked there was craziness, at every street corner people thrust swag items into your hand which you just accepted because at some point you realize it is futile to explain you don’t need a Defiance key ring, a True Blood rubber bracelet or an Ender’s Game button. My prize possession of this free crap bonanza is the Sharknado t-shirt. Street view of the madness that surrounds San Diego’s Comic Con. We continued on to the actual convention hall. Now, we did not have tickets to get inside, but this did not matter, the spectacle surrounding the place was more than enough to entertain almost anyone. Behind the convention hall was a life size display of The Shire made completely of legos, the actual mystery machine from Scooby doo and three story tall inflatable Teen Titans, it was madness. 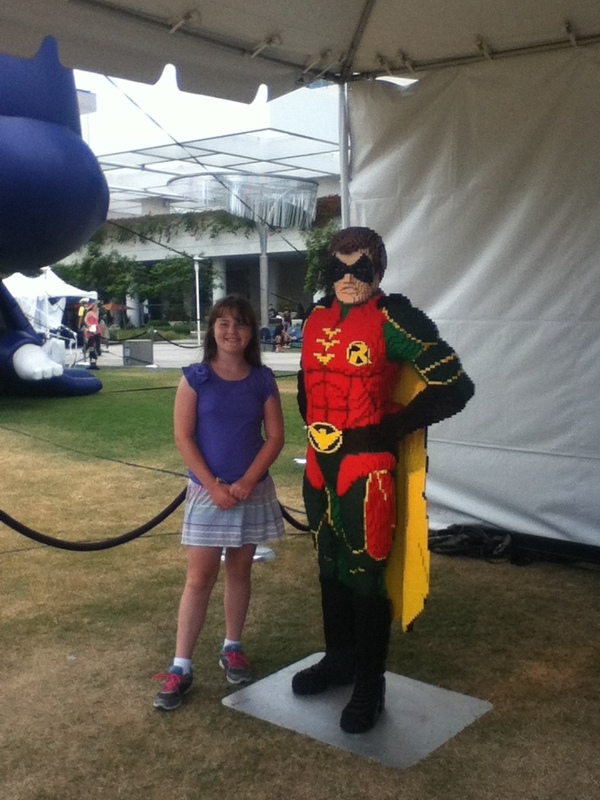 Lil Mayhem with her lifesize lego friend. After taking in as much as our midwestern sensibilities could comprehend we made our way back to our car in its very expensive, tiny resting place. We made quite a haul that day, and saw many unusual sights but the highlight of my daughter’s day was captured in this picture, which she is now lobbying to have made into our Christmas card. 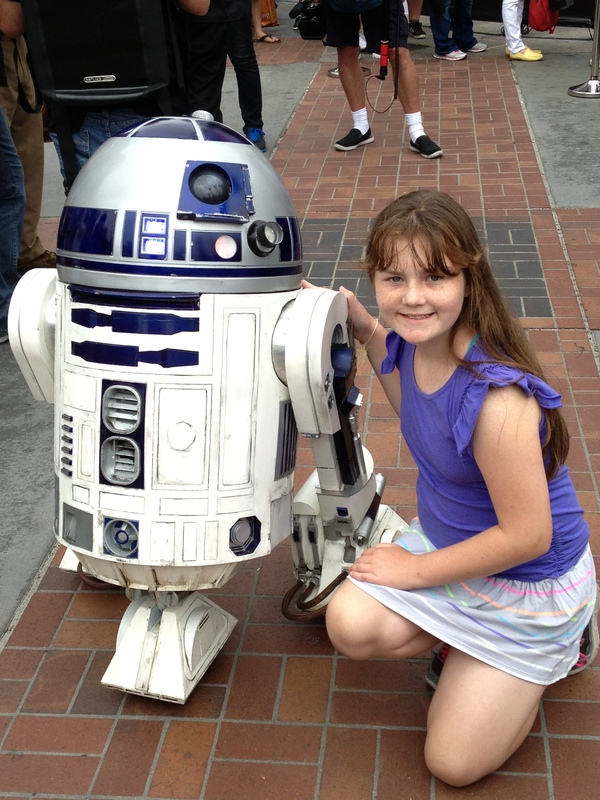 Yes little one, this is the droid you have been looking for.